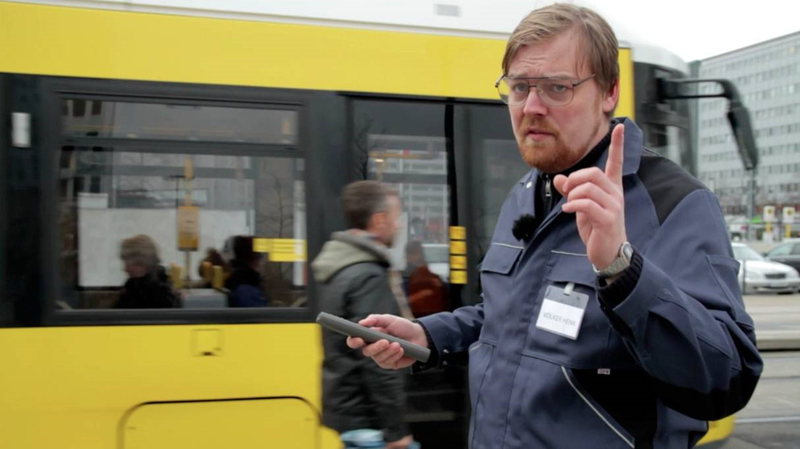 Volker Henk has been working for the local city authorities for years, he’s in charge of the automation of urban activities. He impressively demonstrates the myriad possibilities of his universal remote control. But when it gets stolen, the city succumbs to apocalyptic chaos. Erik Schmitt was born in 1980 in Mainz. He studied Communications in Munich, Melbourne and Berlin. After extensive travels around the world and his first cinematographic work experience, he founded Kamerapferd together with Stephan Müller. His films include: HOW TO FLY HIGH (NICHT NUR DER HIMMEL IST BLAU, short, 2009), SOLARTAXI - AROUND THE WORLD WITH THE SUN (doc, 2010), NOW FOLLOWS (NUN SEHEN SIE FOLGENDES, short, 2010), MY MIND WANDERS (ICH SCHWEIFE AB, short, 2012), RHINO FULL THROTTLE (NASHORN IM GALOPP, short, 2013), TELEKOMMANDO (short, 2014), FOREVER (short, 2014), and his feature debut CLEO - IF I COULD TURN BACK TIME (2019).